Just in time for the school Easter holidays, Butlin’s £40m Splash pool opened to the public on Saturday. 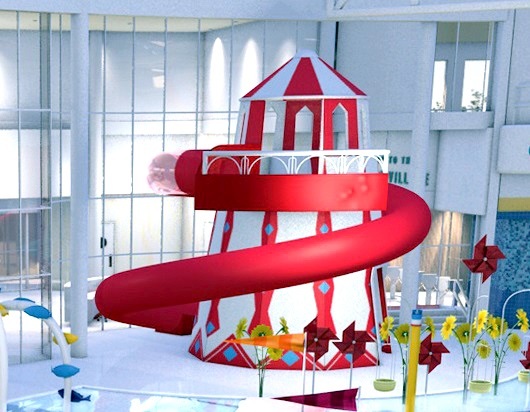 Boasting the first helter skelter inside a swimming pool, a host of new features are expected to attract more visitors to the Bognor Regis resort. As well as the helter skelter slide, six other features in the pool, such as the Seaside Garden rapids and Stick of Rock slides, are alongside quieter areas for young children. The entire pool is almost one-third larger than the centre’s previous pool and can accommodate around 950 people at one time. The building pays tribute to the past with a traditional fountain and exterior design in an Art Deco style but it is also thoroughly modern with cutting-edge energy efficiency and water usage. Members of parenting website Mumsnet were consulted to ensure the changing village was designed to meet the needs of families, with heating, larger lockers and changing rooms big enough for families.